Between the summer of 2005 and the summer of 2006, the Gomers made five official scrapbooks for each of the five guys in Third Day. The first one we made was for Brad. Joanne presided over it, gathering pages from everyone that wanted to participate, and making pages for those who wanted to send in birthday wishes by email. For the next four books, Kendell became the official Gomer Scrapbook Mistress. Some of us were able to give Brad his book in person at a concert in Lubbock Texas, but no one thought to ask him to record a “Thank You” video, so we don’t have one of him. We don’t have one of Mac, either, because we had to mail him his scrapbook, his birthday being on Christmas and not during a tour. He came to the message boards to tell us how much he enjoyed the gift. (See below.) We are blessed to have video of David, Mark, and Tai, each telling us how much they enjoy their birthday scrapbooks. Click each picture to start the videos. (They will may a few minutes to download the first time you watch them.) Click here to see some of the beautiful scrapbook pages made by Gomers from all over. Look for threads with “Scrapbook Pages” in the title. Here is David's "Thank You". Here are some pictures of Tai enjoying his scrapbook. Click to see the pictures larger. His video is below. 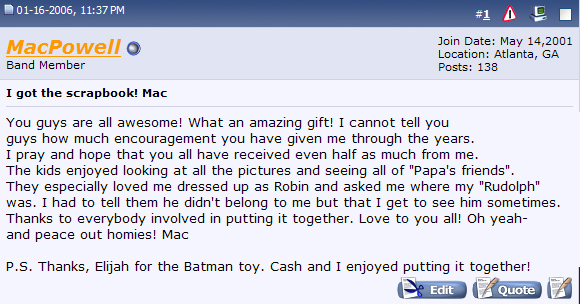 Here is Mac's "Thank You" post on the Third Day message boards. Click the image below to see it full sized. And here is Mark's "Thank You" video. Special thanks to Bari, Jamie, Terra, and Kendell for getting these pictures and videos!